This weekend hot clicks features football notes from around the NFL and college football and lovely lady of the day Hannah Jeter. This is the last weekend without college football or NFL action until mid-January. 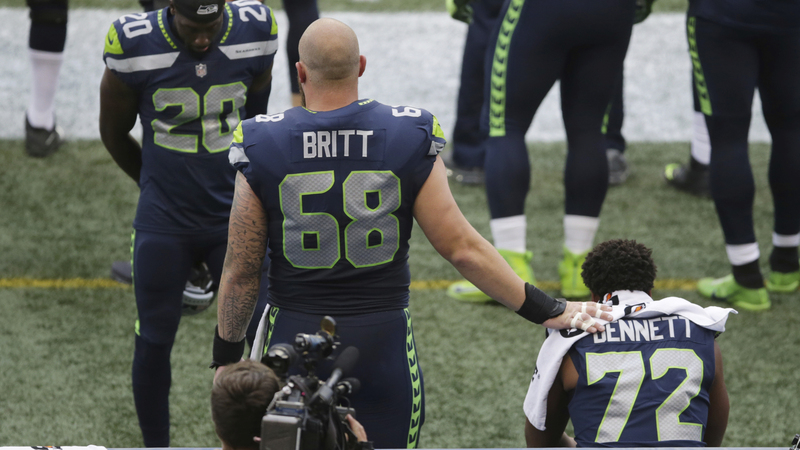 Seahawks’ kicker Blair Walsh taunted his former Vikings teammates (who he says taunted him first) after a 52-yard field goal, and lineman Justin Britt supported Michael Bennett in his anthem protest. Jim Harbaugh refuses to update his roster, and former Texas quarterback Chris Simms said "$100 handshakes" were -- and remain -- common in college football. And more details from the Freeze debacle: He called a Houston "massage" company during a recruiting trip. Hamburg’s Nicolai Muller became the latest athlete to injure himself while celebrating. Check out this vicious spill he took while jumping and spinning to celebrate a goal. Are they paranoid or this actually happens? After whiffing on so many alternate uniforms recently, Notre Dame nailed their tribute to Knute Rockne. Check out these beauties they’ll wear against Navy in November. Former ESPN reporter Britt McHenry and Kevin Durant got into a serious Twitter beef after Durant said hell skip the Warrriors’ White House visit. College football’s top 25 uniforms for the 2017 season ... The Jaguars found their new quarterback ... A tech billionaire wants to split California into three states ... 5 potential head coaching jobs for Art Briles in 2018 ... The perfect offseason landing spot for Mike Moustakas ... Pedro Martinez came out of retirement to throw HEAT during a charity baseball game ... The Pelicans’ owner forgot Anthony Davis’ name. He broke his own record for the fastest inside-the-park home run during the Twins’ win over the D-Backs on Friday night. Text and video Email andy_gray@simail.com with any feedback or ping him on Twitter. Click here for previous editions of Hot Clicks. Visit our Extra Mustard Page throughout each day for more offbeat sports stories and the latest Cheerleader of the Week gallery. Also check out the SwimDaily Page for the latest updates and Instagram pictures of models who have appeared in our issues.